General Recollections and notes from June (Confer) Lewis, daughter of Robert 'Bob' James Confer. Ellsworth Raelson 1907? AKA - "Joe"
Walter Wellington 1910? 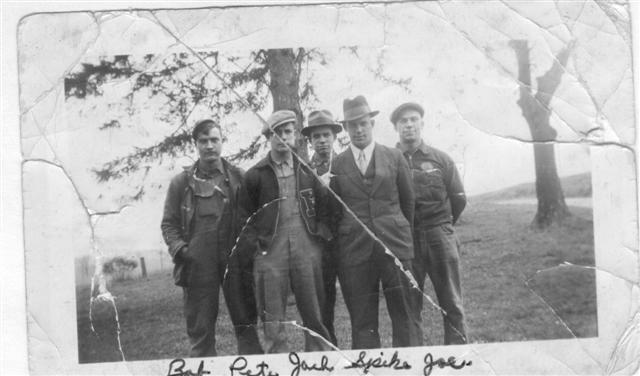 AKA "Spike"
Robert James 1913- 1971 AKA "Bob"
Jacob Rawlen 1916 AKA "Jack"
Harold Larue January 1919 AKA "Pete"
Uncle Spike, Uncle Jack (Screechy). Uncle Joe all drove truck. Daddy (Robert James) and Uncle Spike has bad cases of the flu in the 1920's, bedridden for some time, almost died, Daddy developed mastoid behind ear, had it removed, scar. Grandpap (Jacob) was married twice. First time for about six weeks, wife would not leave home so divorced her. Grampap (Jacob) had one sister - Laura, married a karns, had two children, one died after falling off a wagon onto a pitchfork, other named Carlton Karns, possibly still living - then she married a Parks, no children. Laura lost her hand or arm somehow. Daddy's (Robert Jame's) sister Louise was married three times. George Zigler, George Heddings, George Reichenbach. No Children. Bruce Beaver was a friend of Daddy's (Robert James). Went to hunting camp, owned Sharp's (Hasselhoff) farm. Uncle Pete (Harold Larue) had his picture taken with John Wayne in New Guinea while in the service.